The Red Bull Honda World Superbike Team offers its most heartfelt condolences to Nicky’s family, his fiancée Jackie, his friends, fans and everyone who has been touched by the passing of one of the racing world’s most loved sons. Nicky’s passing has shocked and saddened everyone in the team and we are still coming to terms with this tragedy. However, we will participate in this weekend’s WorldSBK round at Donington in the United Kingdom. Rest in peace Nicky. You will be truly, deeply missed by all of us. “It seems impossible that Nicky is no longer with us. Nicky was not only an outstanding rider, but also a shining example of sporting ethos and professionalism. “The “Kentucky Kid” perfectly represented the values of the sport and the American school of motorcycling. The level of affection and support that the global sports community has shown Nicky demonstrates how much his kind persona and his genuine passion for motorcycling have left a mark in the hearts of motorsport enthusiasts and insiders, and his incredible legion of fans around the world. It is such a shame we only had eighteen months working together, but we have many happy memories during this time. Seeing Nicky return to the top step of the podium in Sepang last year was very special and also his podium at Laguna Seca was a real proud moment as Nicky was always so passionate when racing in front of his home fans. 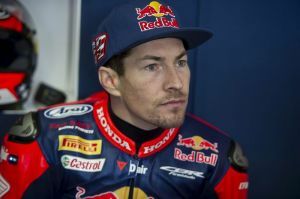 “This is a huge shock to me, the whole team, the World Superbike paddock and actually the entire racing world. We only had the pleasure to work with Nicky for one-and-a-half years but we came to know him like all his previous teams spoke about him: fanatical about bikes, hard-working, charismatic but above all, he was pure and genuine. He was Nicky!